The polar vortex might not exactly be considered a ‘trend’ per se, but the beauty of arctic white sure is. 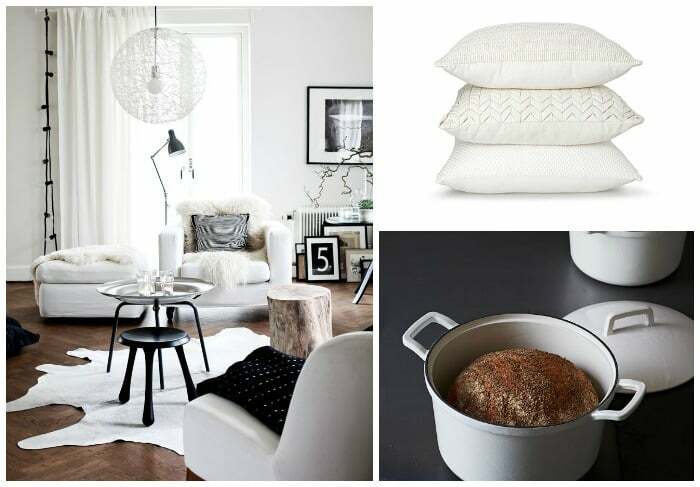 I was first drawn to this vibrant white in Scandinavian home decor. I loved how much colors popped in a white room, and how beautiful and serene the spaces looked. 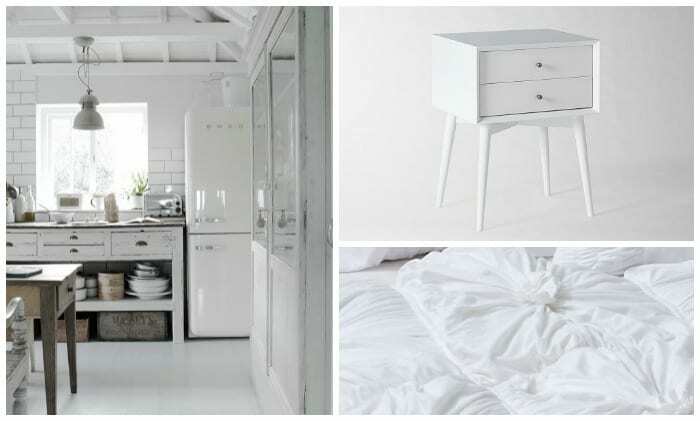 Arctic white can be incorporated into the home and your style in a number of different ways (yup, even just a white tee). One thing I especially love is that this trend can hold up all year long. 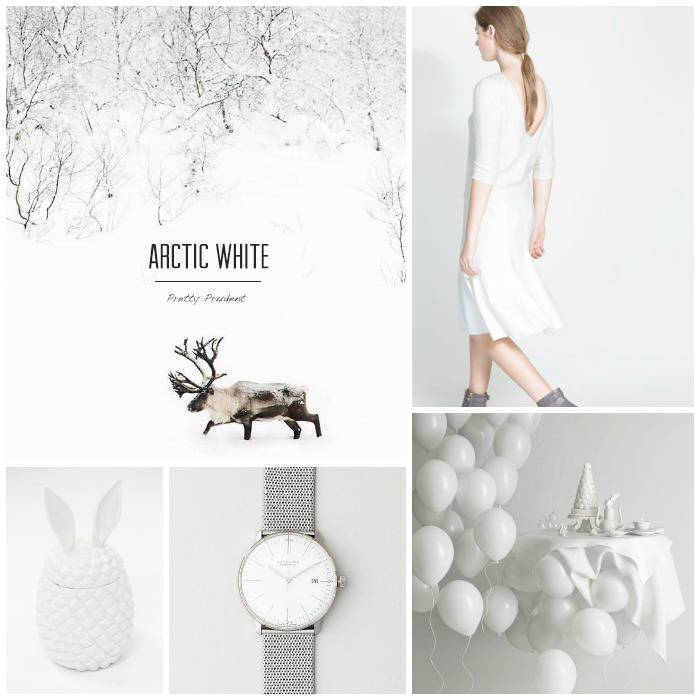 In the winter a white space or outfit can remain simple with a touch of sparkle to mimic a winter wonderland. In the spring and summer you can incorporate bright and rich colors with it. In the fall have fun mixing up arctic white with bold patterns and prints. That touch of sparkle can be found in jewelry and accessories like this watch from Steven Alan, or these earrings and bracelet from Anthropologie. Use the Pineapple Bunny Container from Beklina as a centerpiece for the dining room table. Stay warm with the Angora Sweater from Zara. Caribou photo credit Jasper Doest. Balloon table image credit Klara G.
I’ve had my eye on the Farm Rucsack from Makr ever since I spotted it on Ruthie Lindsey Design’s Instagram. The heart mug from Lumens is perfect for Valentine’s Day. Serve up dinner in a set of ceramic bowls from Sara Paloma Pottery. I dream of having a whitewashed kitchen like this, and curling up under this fluffy Rosette Quilt from Anthropologie. The Mid-Century Nightstand from West Elm would be pretty ideal too. Cover a couch or chair in comfy cushions from Country Road. Cook up a delicious meal in the Enamel Cast Iron Dutch Oven from West Elm. Kristofer Johnsson shows off the impact Arctic white can have when mixed with rich, dark colors in this Apartment.